What brought you to SJU? Do you remember why you declared an IR major? I had a friend who was a student at SJU and loved it, which prompted me to look at the school. I’m from Maryland and I wanted to be in a city that wasn’t super close, but not too far away, so Philadelphia was a great choice. I remember touring SJU and pretty much falling in love with it. I loved the campus, and everyone was so friendly and welcoming. I was originally a political science major, and eventually decided to declare a double major in political science and international relations during my junior year. I had an increasing interest in international affairs throughout the course of my studies, so declaring a double major made sense to me. There were also a lot of interesting courses offered, like Model European Union with Dr. Baglione. What extracurricular or professional activities (internships, research, etc.) were you involved in at SJU? I was a Hawk Host and a member of the College Democrats Executive Board. I also was part of the Sustainability Club. I was a volunteer on Hillary Clinton’s first campaign (back in 2008) and then worked on Barack Obama’s presidential campaign during the fall of 2008. I was a deputy field organizer for his campaign in West Philadelphia and at SJU where we were involved in bringing people like Senator Bob Casey (D-PA) to campus. We also registered a lot of students to vote! I interned for Senator Barbara Mikulski (who I ended up working for after I graduated) the summer before my sophomore year. I also studied abroad in London during my junior year, and took some really interesting courses at the University of Westminster—one in international security studies and another about the foreign policy of the European Union. While studying abroad, I also interned at Anti-Slavery International, a human rights organization dedicated to ending modern day slavery in countries throughout the world. How did your experience at SJU, both generally and in the IR department, shape your career path? I always give credit to Dr. Baglione for encouraging me to seek a job on Capitol Hill. I will never forget sitting in her office, about to graduate with no clue what I was going to do next, and having tell me “Kelley, if you can get a job on the Hill, you should take it.” My opportunity to work for Senator Mikulski was a great opportunity that ultimately led me to my current job in government affairs. Thanks Dr. Baglione! 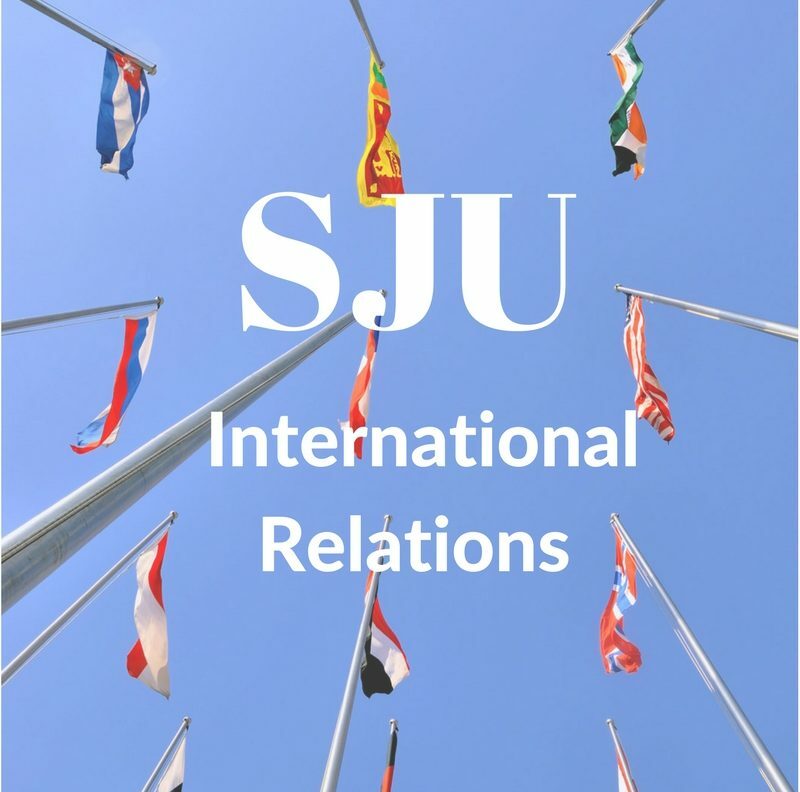 What makes the International Relations department at SJU special? The professors and their mentorship, as well as the unique opportunities and experiences I had. Between the course offerings and study abroad opportunities, you can really tailor your education experience to fit your interests. What advice/insight do you have for SJU students interested in your field? I always get questions about working on Capitol Hill and/or going to law school, so I’ll lead with advice related to these two things. If you are interested in working in on Capitol Hill, getting an internship is the best way to get a foot in the door. Many offices like to hire previous interns. SJU also has the Washington program, which I would highly recommend for anyone who knows they want to work in DC. DC is all about networking so the more connections you can make, the easier it will be for you to find a job. Also, if you do end up getting an internship on the Hill, take advantage of it. Don’t be afraid to email staff in offices with jobs that you find interesting and ask them if they would be willing to grab coffee with you to discuss what they do. I would always respond to requests for coffee from interested interns! Some people will be 100% sure about pursuing graduate school immediately after they graduate, and if that’s you, then great! However, if you are unsure about graduate school, take a year or two off and get some work experience before making a decision about going back to school. Don’t rush into grad school if it’s something you aren’t sure about. I spent two years working on the Hill before going to law school, and I’m really glad I made that decision. It allowed me to talk to more people and get more perspective about pursuing a JD. I also made the decision to go to law school part-time during the evening, which is something I probably wouldn’t have done if I had gone straight to law school after college. Going part-time allowed me to advance in my career while getting my law degree, and even though it was hard at times, I’m glad I did it that way! To be determined! I really like the job I have now and the company I work for. I have a lot of unique opportunities and I’m always learning. In my current role, I work with Congress and defense industry representatives in DC to advocate for the Department of Defense programs my company works on, as well as defense acquisition policy matters. I just recently became a member of the DC bar, and while I don’t plan on being a practicing attorney, it’s always good to have that as an option. Previous From Education to Action: How SJU courses prepared me for Washington.